When you’re listening to music on your iPhone, the controls you see are different depending on which way you hold your iPhone. When you hold your iPhone vertically, you see controls that don’t appear when you hold your iPhone sideways. Furthermore, the controls you see when viewing the Playlists, Artists, or Songs lists are slightly different from the controls you see when a song is playing. Here’s another cool side effect of holding your iPhone vertically: If you add lyrics to a song in iTunes on your computer (by selecting the song, choosing File→Get Info, and then pasting or typing the lyrics into the Lyrics tab in the Info window), the lyrics are displayed along with the cover art. Back button: Tap to return to whichever list you used last — Playlists, Artists, or Songs. Switch to track list button: Tap to switch to a list of tracks. Repeat button: Tap once to repeat songs in the current album or list. The button turns blue. Tap the repeat button again to play the current song repeatedly; in this mode, the blue button displays the number 1. Tap the button again to turn off this feature. The button goes back to its original gray color. If you don’t see the repeat button, the scrubber bar, and the shuffle button, tap the album cover once to make them appear. Scrubber bar: Drag the little dot (the playhead) along the scrubber bar to skip to any point within the song. *Genius button: Tap once and a Genius playlist appears with 25 songs that iTunes thinks will go great with the song that’s playing. The less popular the song, artist, or genre, the more likely the so-called Genius will choke on it. When that happens, you see an alert asking you to try again because this song doesn’t have enough related songs to create a Genius playlist. New: Select a different song to use as the basis for a Genius playlist. Refresh: See a list of 25 other songs that go great with the song you’re listening to, at least according to iTunes. Save: Save this Genius playlist so that you can listen to it whenever you like. If you like the Genius feature, you can also create a new Genius playlist by tapping the Playlists icon at the bottom of the screen and then tapping Genius, which is the first item in the list of playlists. Shuffle button: Tap once to shuffle songs and play them in random order. The button turns blue when shuffling is enabled. Tap it again to play songs in order again. The button goes back to its original color — gray. You can also shuffle tracks in any list of songs — such as playlists or albums — by tapping the word Shuffle, which appears at the top of the list. Regardless of whether the shuffle button has been tapped, this technique always plays songs in that list in random order. The Shake to Shuffle option, when enabled, lets you shake your iPhone from side-to-side to shuffle and play a different song at random. Restart/previous track/rewind button: Tap once to go to the beginning of the track. Tap this button twice to go to the start of the preceding track in the list. Touch and hold this button to rewind the song at double speed. Play/pause button: Tap to play or pause the song. Next track/fast forward button: Tap to skip to the next track in the list. Touch and hold down this button to fast-forward through the song at double speed. AirPlay selector icon: You may or may not see the AirPlay Selector icon on your screen. AirPlay lets you stream content wirelessly over Wi-Fi from your iPhone to any AirPlay-enabled device. 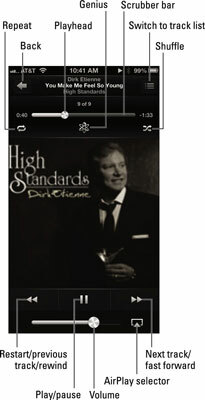 Check out the AirPlay sidebar for the details. Volume control: Drag the little dot left or right to reduce or increase the volume level. If you’re using the headset included with your iPhone, you can squeeze the mic to pause, and squeeze it again to play. You can also squeeze it twice in rapid succession to skip to the next song. Sweet! When you tap the switch to track list button, the iPhone screen and the controls change. Switch to Now Playing button: Tap to switch to the Now Playing screen for the current track. 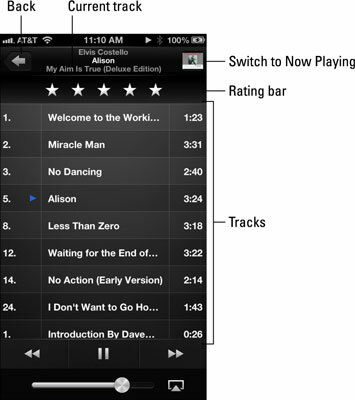 Rating bar: Drag across the rating bar to rate the current track using zero to five stars. The track shown has a five-star rating. The tracks are the songs in the current list (Albums, Playlists, or Artists, for example). The current track indicator shows you which song is now playing (or paused). Tap any song in a track list to play it.